1. It does not work well for rooms that have an area greater than 1400 square feet. 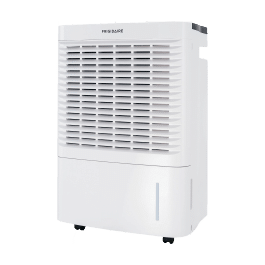 One of the most popular dehumidifiers available these days is the Frigidaire FAD704DWD Energy Star, which we reviewed thoroughly. Frigidaire claims it to be the best basement dehumidifier, and the ratings that this dehumidifier has received may support this claim. However- that is not how one proceeds while looking for the best 70-pint dehumidifier that money can buy. Let us go ahead and see what the features of the Frigidaire FAD704DWD are, what it offers and what it misses. The Frigidaire FAD704DWD Energy Star model that we are covering in this review acts as an excellent dehumidifier for a 1400-square feet room. It can remove up to 70 pints of moisture per day, protect the home from mildew and mold due to moisture, and bring the humidity down to the precise level that the user sets. Frigidaire claims it to be an energy efficient model that is also very easy to use and maintain. 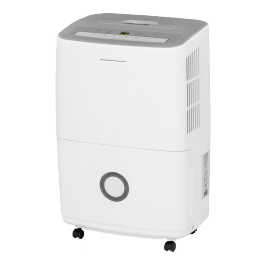 Frigidaire/Electrolux are amongst the most trusted brands in the market, which is why this dehumidifier seems like a product that users can depend upon. The first thing to note about the Frigidaire FAD704DWD dehumidifier is its capacity- as the name suggests, it is capable of removing 70 pints of water from the air in a period of 24 hours. This is what makes it a ‘high capacity humidifier’. It comes with a splashguard to prevent spilling out of the water- something that every humidifier must have. Frigidaire has been quite careful with the design, which is why that moving it around is easy compared to the large capacity that it offers. It has caster wheels as well as built-in carry handles on both sides, which make it a highly portable unit. Its dimensions are 19.8×11.54.14.57 inches. You will get all necessary information on the hardware and design on the user manual. Next in this Frigidaire FAD704DWD Energy Star review are the key features that it offers. 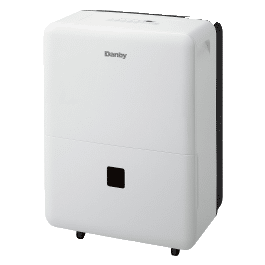 What makes this one of the best dehumidifiers for basements is that it has an antibacterial mesh filter, which is useful for reducing room odors, bacteria and any other airborne particles that may be present. It also helps to keep mildew and mold away from the home. 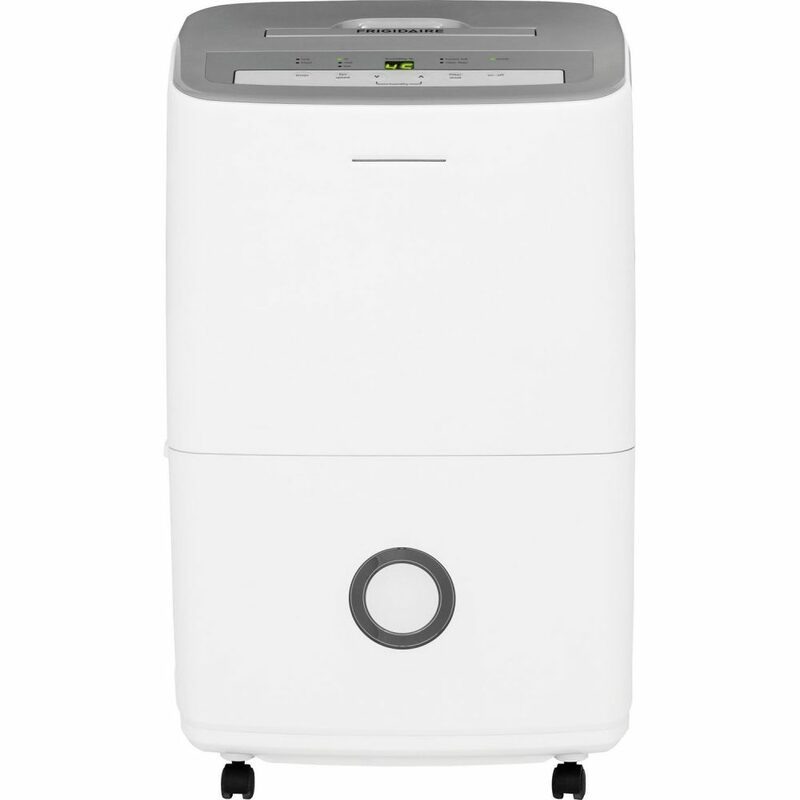 The 70 pints per day humidifier makes it suitable for rooms that have an area up to 1400 square feet. The compressor has a time-delay that does not let it overheat with the circuit trigger that does not trip if the unit is turned on and off too quickly. It also has an automatic restart feature to aid usage after a power outage. The digital humidity readout, electronic controls and an extra-long power cord of length 6-feet makes it easy to use and operate. In order to help users save energy and money, it has a low-temperature operation. The humidifier comes with a 2 fan-speed option that allows greater flexibility. It also has an automatic full-tank alert mechanism, which shuts off as desired. When located near a compatible drain, the unit can be operated continuously. It allows for precise humidity control with effortless controls. One of the best features of the Frigidaire 70-pint dehumidifier is that it can be used continuously when the humidifier is placed near a compatible drain. It comes with a manual or continuous drain option. The empty moisture can be collected manually by removing the water tank. If you want to let the moisture be removed continuously, then all that is required is the attachment of a standard garden hose (0.5 inch in diameter) or a drain hose, which is to be purchased separately. It has an antibacterial filter that will reduce the odors in your room, remove any bacteria and prevent any mold being formed due to moisture. It is extremely easy to use with a range of flexible options, continuous drainage and precise controls that let you set it at exactly the levels that you want. This crawl space dehumidifier comes with a 16.3-pint tank that can be pulled out front using a handle, and has a splashguard for easy removal. Despite its large size, the humidifier can be moved around easily since it comes with integrated caster wheels and side & top handles. There is no need for any extra extension cords with humidifier since it has a 6-feet 3-prong cord. Extension cords are not compatible with this dehumidifier. Despite the 6-feet long extension cord, there are still situations where an extension cord may be necessary. It does not work well for rooms that have an area greater than 1400 square feet. For continuous operation, using it with a suitable drain nearby is not possible due to the limited capacity, which could make this a hassle. 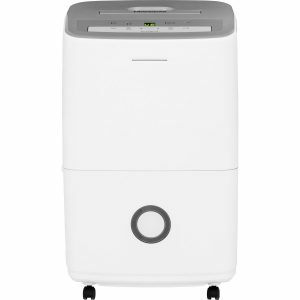 As seen in the various reviews of this dehumidifier, it is quite easy to use. Users can set the exact level of humidity that they want with the humidity controls, and keep a watch on it through the digital display. 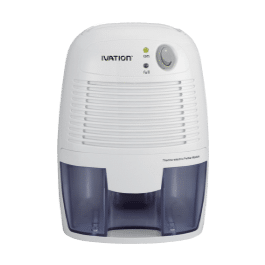 With 3-different fan speeds, efficient controls and a high degree of portability, there is little that this humidifier lacks in making its usage convenient. It is important to review the energy efficiency of any dehumidifier before purchasing it, and the Frigidaire FAD704DWD Energy Star is a clear winner here. It 7.8 Ampere and 745 Watt power; and in order to conserve energy and costs, there is a special low-temperature operation. A thorough review of the Frigidaire FAD704DWD Energy Star warranty information is important to determine if it is a product worth the purchase or not. The dehumidifier is covered under a 1-year warranty, with a limited 2-5 year warranty on its sealed system-, which includes the condenser, compressor, tubing and the evaporator. From a year after the initial purchase date, all costs for its replacement and repair for any part will be borne by the manufacturer. From the 2nd to the 5th year, diagnostic, labor and other part costs, along with its transportation, removal, and installation will be covered by the consumer, except for those parts that are in its sealed system. Repairs/replacement for defects in the workmanship or the materials of such parts will be taken care of by Electrolux. Taking into consideration all the information in the review, it will be quite safe to say that the Frigidaire FAD704DWD Energy Star is a product that is worth the money spent on it. 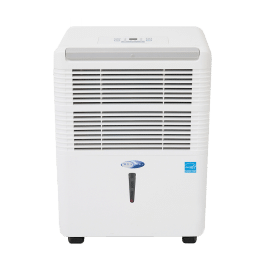 For areas under 1400 square feet, this is an ideal dehumidifier that comes with precise and easy controls, ease of use and energy-efficient technology. The Frigidaire FAD704DWD comes to you by one of the most trusted names in the market, which makes it obvious that no false or misleading claims have been made here. Thus, if you are looking for a value-for-money product to function in a limited area, then as per this review, the Frigidaire FAD704DWD Energy Star is a worthy investment. Not only will it offer an excellent performance with a great ease of usage, but will also go on to prove a durable and long-lasting product- something that we all desire from our home appliances. Go on and give it a try! There is surely no reason that would make you regret the choice of trusting on Frigidaire/Electrolux! Q: Why can’t an extension cord be used with this unit? A: The Frigidaire FAD704DWD consumes 7.8A/745W of electricity in order to operate normally. This is a large amount of electricity and too much for any normal extension cord, which can turn into a fire hazard if used. A heavy-duty extension cord that has a rating for more A/W than this unit may work fine, but is not recommended by Frigidaire. Q: Is it required to place the dehumidifier higher than the drain for working? A: Yes, in order for it to work, it will have to be placed as such since it only drips down. An alternative to this is to purchase a condensate removal pump and use it along with the dehumidifier. The unit will drip into the pump, which can then be used to drive up the water into a drain. Q: Does the Frigidaire FAD704DWD require a change of filters? A: There is no need to change the filters on the dehumidifier since it is washable. All that is needed for that is to slide the filter out, run water over it to clean, dry the filter and then put it back in. Q: Does the hose for drainage come with the unit? A: No, drainage hose is not supplied- and any normal garden hose can be used. Woot, I will cetnairly put this to good use! brief and precise advice… Thanks for sharing this one. every little bit of it I have you bookmarked to check out new stuff you post. Gladly welcoming you to pay visits to our site on a regular basis. stumbled upon it on Yahoo , I shall come back once again. Hey did you go through the latest blogs we posted? You are not very far from getting the best blogs in the town, grab them out. Miss it, miss everything. Congrats for reaching out to the gratuity your heart desires for. Lucky us to have mellow visitors like you. Thanks for your nicest appreciation.